SV Angel: "We Won't Pass On Old Entrepreneurs"
There has been a lot of discussion recently about the “peak age” of entrepreneurs. “Old Guys Rule,” said Vivek Wadhwa in 1999, citing data that showed that men over 40 who were married and with children have the highest chance of success (no data was shared on female entrepreneurs). But more recently there’s been a definite trend, particularly in the consumer Internet and mobile space, towards very young founders. The peak age is around 25, said one venture capitalist, drawing a comparison to professional athletes. 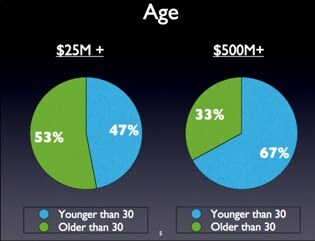 And SV Angel shared data on stage at TechCrunch Disrupt last week showing that more than 2/3 of startups that have $500 million or higher exits are started by entrepreneurs under 30 (see image above). To counter the counter-argument, Adeo Ressi argued earlier this week that older entrepreneurs are actually performing better on their Founder Institute aptitude tests, and they expect great things from them. And now SV Angel partner David Lee wants to clarify the data they presented at TechCrunch Disrupt. In particular, he says, that data doesn’t affect how they make investment decisions going forward. It just shows how previous investments worked out. I had the privilege of speaking at TechCrunch DISRUPT last Monday with Michael Arrington and Ron Conway. The subject of the talk was “What Makes Great Entrepreneurs Great.” Initially the scope of the talk was to have Ron share some of his stories to give a birds-eye view into his decision making process, which he has developed over a 15+ year career. Coincidentally during the few weeks before the talk, we at SV Angel also had been collecting data from 500+ founders funded by Ron or SV Angel during the past 10 years or so. We wanted to use the data to determine whether there were any patterns in measuring startup success – whether there is a Moneyball or 538 approach that could be gleaned from the reams of data accumulated over the years. Even though we’re in the early days of this effort, we thought it’d be interesting to share some of the data, and pepper some of Ron’s stories with the early results. Truthfully I was a little wary to present the data in this raw of a form but thought it would be interesting and thought-provoking nonetheless. Given the limited timeframe, we decided to touch on some of the biggest myths around tech startups: (1) young founders are “better” (e.g., the archetypal boy-wonder), (2) one founder is not enough, and (3) repeat founders are more successful. Here’s the link to the talk. The anecdotal feedback we received was generally positive (I think). But there were at least a couple of founders who were discouraged by it – or more likely, the way I presented it. The takeaway for them was that we would be disinclined to fund founders who didn’t fit within certain parameters as suggested by this data – for example, weren’t young enough, worked alone, or were first-time founders. I just want to say as clearly as possible that we don’t use this data as any sort of guide when making any investment decision. Not only is it too early to do so, we are skeptical that any analysis of this type – no matter how comprehensive or rigorous – will ever be a good proxy for startup investing. Correlation is not causation, let alone prediction. So, to follow this data blindly would be idiotic. We would never pass on an entrepreneur just because they are “too old,” have never started a business or don’t have a specific team composition. We don’t do this because we are good guys; we do this because it’s good business. We generally look for “founder-market fit” – founders who personify their product, business and ultimately their company. In the early days, this usually means building something for themselves or starting a company in a sector where they have deep domain expertise (or both). Obviously there is no archetype for this. And as we’ve seen the range of markets and opportunities expand recently, we’ve also seen the range and diversity of entrepreneurs expand as well. We’re excited by this, and have every reason to think that this will only continue as more offline dollars flow online, and startups address new markets – both domestically and abroad. No data can predict who will be most capable of attacking these massive opportunities.